Andres Garcia, who hasn’t lost to an opponent from Nevada all season long, was on the mat at Clark High Friday afternoon and evening for a total of 2 minutes, 18 seconds. The mindset changed this season for Andres Garcia. Ask the Spring Valley 138-pounder, and he tells you it had to. Garcia, who hasn’t lost to an opponent from Nevada all season, was on the mat at Clark High Friday afternoon and evening for a total of 2 minutes, 18 seconds. He beat Rebecca Resto of Silverado in his first round match, taking just 44 seconds to win by a fall. He then dispatched Foothill’s Darren Raines in 1:34, raising his total wins by pin this season to 37. Garcia is now 43-3 this season. Garcia has made sure the hauntings have been few since he won the state title at 132 pounds a year ago. 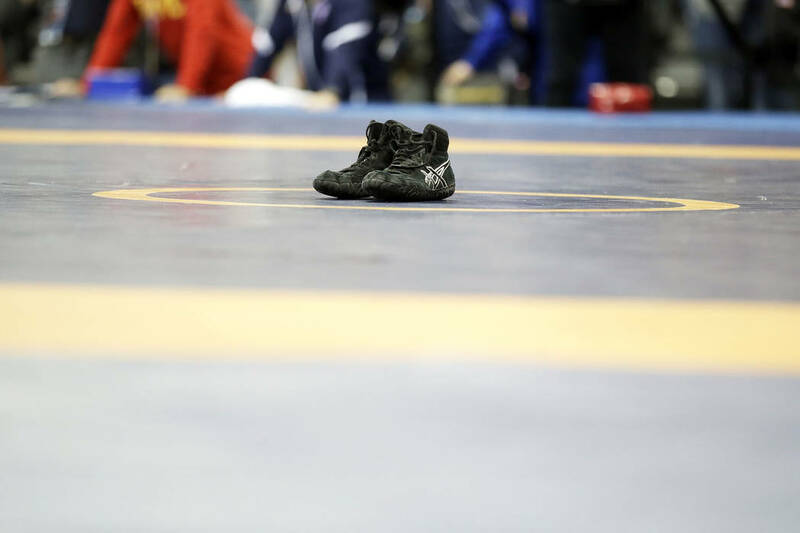 He lost to the defending state champion from New Mexico, and to a pair of wrestlers from Arizona, early in the season. Two of those losses came at the Holiday Classic tournament in December in Las Vegas. “I won that tournament last year, so those losses haunt me even more,” Garcia said. To keep any further disappointments away, Garcia has gone to work even harder as he tries to win a second consecutive state title. He will face Caleb Uhlenhopp — one of 11 Green Valley wrestlers that advanced to the semifinals — at 10 a.m. on Saturday. Uhlenhopp beat Steven Camacho of Clark with a fall at 1:43 in his quarterfinal match on Friday. The Gators scored 56 points as a team to take a lead over challengers Spring Valley (50) and Foothill (43) for the team title. Green Valley won the last eight Sunrise Region titles before realignment placed them in the new Desert Region this season. But Green Valley remains in its familiar position, poised for a region title. The final results will be known sometime after the region championship matches that begin at 3:30 p.m. on Saturday at Clark. But first there are those 11 semifinals, and several wrestle-back (consolation) matches where points can be scored. These big matches also will decide who goes to the state tournament and who stays home. His semifinal opponent’s coach completely understands. 106–Reyes, SIL, p. Rivera, LIB, 2:15; Velasquez, SVIS, d. Beas, FTH, 9-6; Mitchell, SPV, p. Klanian, GV, 1:08; Garcia, DO, p. Brock, COR, 5:29. 113–Favela, DUR, d. Guarin, SVIS, 18-2; Lovett, SPV, p. Larson, COR, 0:35; Crinigan, FTH, p. Garcia, SVIS, 3:42; Silva, FTH, p. Gerber, SIL, 1:36. 120–Gauge, GV, p. Alexander-Chavez, DO, 4:47; Evans, FTH, p. Ramsey, SVIS, 1:35; Nishi-Rivera, SVL, d. Dennett, BAS, 11-5; Dias, GV, p. Wilcox, SIL, 0:59. 126–Cuamba, LIB, d. Young, BG, 6-4; Lorson, FTH, p. Celestino, DUR, 1:54; Batara, COR, p. Quibuyen, SIL, 5:42; Zernich, GV, p. Gomez, SPV, 0:25. 132–Hristov, SPV, p. Pellegrino, FTH, 0:21; Kalayanaprapruit, GV, d. Zerhouni, SVIS, 4-3, OT; Snowden, DUR, p. Brock, COR, 2:48; Serrano, FTH, d. Pedersen, SIL, 18-6. 138–Garcia, SPV, p. Raines, FTH, 1:34; Uhlenhopp, GV, p. Camacho, CLK, 1:43; Castillo, BG, p. Kazel, FTH, 1:56; Marzola, LIB, d. Labaina, BAS, 9-5. 145–Hannold, COR, p. Canada, SPV, 0:11; Rookhuyzen, LIB, p. Coleman, CLK, 0:37; Grady, SVIS, p. Olson, COR, 4:34; Recktenwald, GV, p. Russo, FTH, 0:55. 152–Gardner, SIL, p. Song, BG, 3:43; Schneider, FTH, p. Kares, GV, 5:59; Renshaw, DUR, d. Paulino, DO, 14-1; Hoffman, GV, p. Taylor, SVIS, 3:07. 160–Gomes, BAS, d. Bomareto, SVIS, 12-7; Wirig, FTH, p. Mena, DUR, 1:31; Darlington, COR, p. Morton, BG, 3:17; Scott, GV, p. Magana, SIL, 1:25. 170–Gardner, GV, p. Perez, COR, 1:11; Brenkus, BG, p. Cates, LIB, 4:50; Aitala, SIL, p. Harris, BAS, 3:17; Bowers, GV, p. Milton, DUR, 0:18. 182–Laikupu, SVIS, p. Taylor, BG, 5:10; Haycox, COR, d. Rios, FTH, 7-5; Sutton, COR, d. Brooks, SPV, 6-2; Espinoza, BAS, p. McCraw, DO, 2:18. 195–Pelton, DUR, p. Beck, SIL, 1:39; Whiddon, LIB, p. Maes, BG, 2:52; Gennuso, GV, d. Abbott, SPV, 8-2; Marzka, COR, d. Perez, CLK, 14-5. 220–Candland, SIL, p. Varnado, BAS, 3:51; Ramsey, SVIS, p. Jacobs, GV, 5:21; Gould, BAS, p. Yehudah, SPV, 3:46; Kendricks, LIB, p. Beaver, DO, 0:21. 285–Romero, BG, p. Maningo, GV, 1:10; Aganu, LIB, p. Golden, DO, 1:07; Bradley, FTH, d. Chung, DUR, 3-0; Duron, BAS, p. Dean, DO, 1:45.